Water Industry Privatisation in the Czech Republic: money down the drain? Transparency International focuses its activity on advocating transparency in decision-making processes and on mapping the scope and depth of corruption. These efforts are carried out in a number of ways, chief amongst them research and analysis, the provision of free-of-charge legal advice to victims of corruption, and anti-corruption education. The water industry is one area to which TIC has opted to devote closer attention. In the attached analysis, we describe the process of privatising state enterprises in the years 1993—1994 and the subsequent transfer of assets without consideration to cities and municipalities, including two mechanisms for preserving the state’s influence over basic municipal waterworks operation (golden share; restrictions pertaining to companies’ Articles of Association and share transferability restrictions). This process throws light on the manner of the water management industry atomisation that followed. 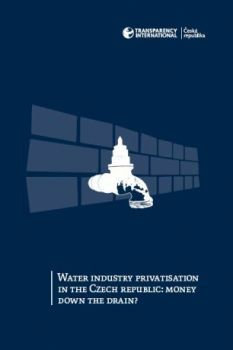 We furnish several examples of water management company privatisation that occurred prior to the Czech Republic’s EU accession through the sale of a share holding in the respective company (Praha, Severomoravské vodovody a kanalizace) or the sale of shareholder rights (Zlín). We provide a further example of a privatisation executed after Czech EU accession by means of what is called a shareholder agreement (Kroměříž). We describe the conse quences of these waterworks privatisations in the final chapter.